Who doesn’t enjoy a spa day? The low lights and soothing music, the pampering, and the warmth of the steam room is nothing short of absolute bliss. Unfortunately, it’s a luxury we don’t always have the time – or money – to indulge in regularly. But imagine if you could bring that spa experience into the comfort and privacy of your own home. With a steam shower upgrade, you can transform your bathroom into a soothing oasis where you can relax and unwind after a hard day’s work (or play). We talked with the experts to find out what homeowners should consider as they plan their own personal spa. Steam is a part of every hot shower. But a steam shower takes it to the next level, making the warm, luxuriating mist the star of the show(er), rather than a secondary benefit. And the mechanics are simple. Adjustable timers mounted inside or outside the shower – sometimes even both – let you control the water’s temperature and the duration of the shower, says Jason Kalai, a service technician with Central Plumbing and Heating in Anchorage. Steam showers can be standalone units like at the spa or, if you’re short on space or don’t plan to use it frequently, combined with a standard shower to create a dual-function space, says Carolyn M. Foelsch, owner of Kitchens & Baths by Design in Fairbanks. 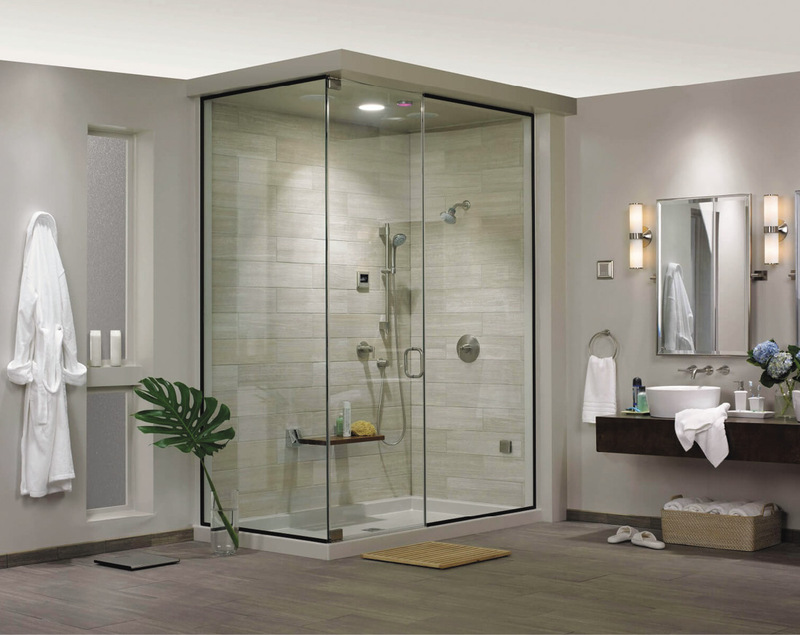 A variety of add-ons let you up the shower’s luxuriating factor even more. “Some can get pretty fancy with features such as touch screen LED control panels, chroma therapy lighting, Bluetooth audio systems with built-in tranquility sounds, and aromatherapy pumps,” Chris says. Other upgrades include quick start systems that create steam in about a minute, regulators that monitor and automatically adjust steam temperatures, and automatic flush features that reduce calcium build-up on the heating elements, he adds. Installing a steam shower is easier in new construction, when the space, electrical and plumbing needed to support the shower can be drafted into the design plans. Adding one to an existing home as part of a bathroom remodel is definitely possible, but it can be a bit more complicated than people realize, Jason says. 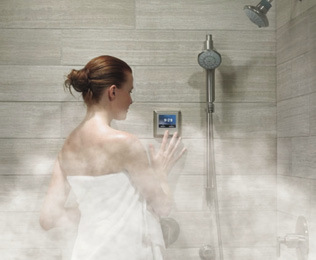 One of the first considerations when adding a steam shower is whether you have the space. For standalone units, Carolyn looks for a closet on the backside of an existing tub or will convert a tub into a steam shower. Keep in mind, she cautions, that converting a tub or shower/tub combination into a steam shower also converts the bathroom into a three-quarter or half-bath, which could affect resale value. Generators are usually tucked into a nearby closet, but Jason says they can be located as far away as a crawl space or even the garage. The shower’s design is another important factor, especially if you’re converting a traditional shower stall to a steam shower. The typical shower has a door or curtain rod that extends only partway up the shower; this gap lets steam escape, the opposite of what you want in a steam shower, Jason says. The tiling or wall covering in most showers also don’t extend floor to ceiling, which can cause moisture damage to the walls. In those cases, you’ll need to extend the tile or wall covering up to, and including, the ceiling, with a material rated for water exposure, Jason says. And an inverted or sloped ceiling, while not a necessity, can prevent water droplets from splashing on to you while you relax, he adds. If you opt for a dual-function shower, Carolyn recommends installing a standard height shower door with a hinged panel to fill the gap. The panel opens out into the bathroom like an awning, which allows steam to escape when you’re using it as a regular shower. Steam bathing may be one of the ultimate luxuries, but it has benefits beyond pure indulgence. “For centuries, medical practitioners have advocated for the health benefits of steam therapy,” Chris says. The soothing moist heat helps relieve stress, relax muscles, ease joint pain, improve respiratory health, and promote deeper, more restful sleep. Regular steam bathing also gives your skin a boost. “Steam is often used in skincare to soften the skin, open up the pores, and to activate products applied to the surface of the skin,” says Klara Higashi, a licensed esthetician and owner of Klara’s Beauty Room in Anchorage. “Twenty minutes of steam once a week is enough to reduce blemishes,” she adds, as it naturally flushes out impurities in the skin, creating a more radiant complexion. And there’s no denying the appeal of a good, long steam bath during those rough Alaskan winters.